Happy Miniature Monday! These are some exciting times, my friends. What recently started as an every-other-week challenge to a fellow miniature painter seems to have gained momentum. I started using a #speedpaintchallenge hashtag on Twitter and with the help of a few retweets, now more miniature painters are joining in. Hooray for social media! I can't wait to see what everyone comes up with. 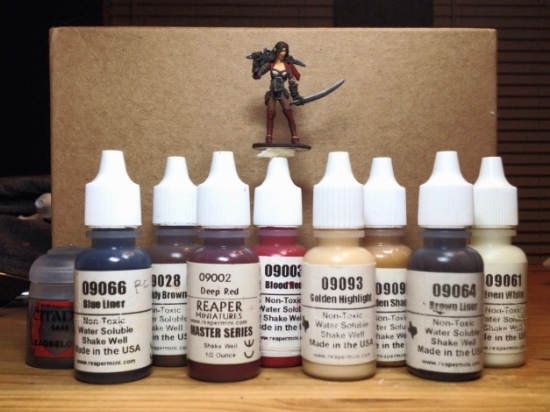 Last week, it was decided that the Speed Paint Challenge would be Reaper Miniature Bones #77131. The Rules: 4-hour Limit. 7 Colors + Black & White. I decided to break down the time limit to eight 30-minute increments. I keep notes on paint color and overall strategy throughout the process. So there you have it-- another Speed Paint Challenge completed! Once again, I gained some great experience in both speed and skill. I stand firm in my belief that a little pre-planning goes a long way when painting within time limits. I'm really happy with how she turned out given only 4 hours. In fact, I have the sudden urge to go out and buy a matching pair of those awesome boots!